With summer in full swing, and the holiday travel season right around the corner, it’s time to plan those last-minute vacations and start thinking about where you’ll be spending your holidays this year. 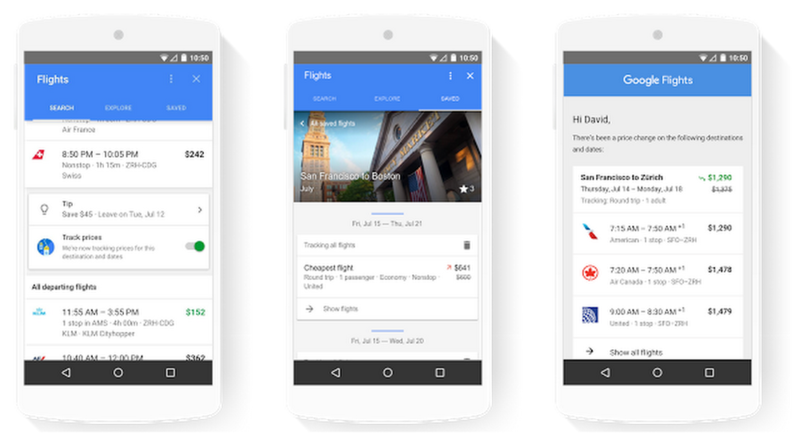 Today we’re announcing several updates to Google Flights and hotel search on Google to make it easier to find the right flight or the right hotel, at the right price, for your next trip. Want to stay up to date on changing flight fares without having to continually check prices? You can now track fare changes for a date and route combination, or track specific flights in Google Flights, by simply selecting to track prices after you’ve searched for a flight. When prices either increase or decrease significantly, you’ll be notified by email and Google Now cards. This is rolling out over the course of the next few weeks in all 26 countries where Google Flights is available. When it comes to booking a hotel, making the best decision can be stressful. We’re now making it easier for you to find the right hotel at the right price. Everyone loves a good deal. 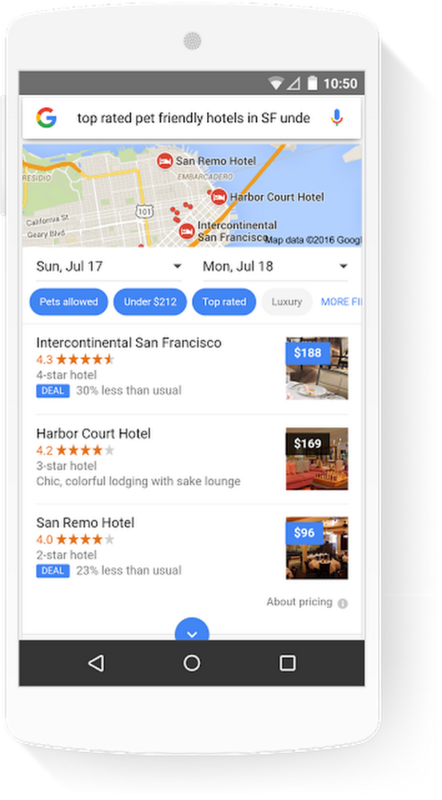 When searching on Google for “hotels in [location]”, you may now see a "Deal" label indicating that a hotel’s price is lower than usual compared to historical pricing, or if there are discounts to the normal rate for those dates. These deals are automatically identified by our algorithms when we see a significant reduction in price. This will be rolling out globally over the next few months. You can now filter results according to your preferences, like “Price” or “Top rated”, with one tap on your phone. You can even combine multiple criteria like “Top-rated pet-friendly hotels in San Francisco under $200” when searching for the perfect hotel. This is now available in the U.S. and will roll out globally later this year. If there is an opportunity to save money or find better availability by moving your dates slightly, we may show you Tips. For example, you may see a Tip like, “Save $105 if you stay Wed, Jul 13 - Fri, Jul 15”. If the new dates work for you, simply tap to update your search and take advantage of the savings. We’ll be rolling Tips out globally over the coming months. We hope these updates make planning your next trip easier and stress-free!